I had so much fun making the previous snowman card that I had to use another new color glitter from Sparkle N Sprinkle called Pretty Princess. I did the same technique of Glitter Lace for the background and used the Waterscape for my first glitter, then the Pretty Princess. 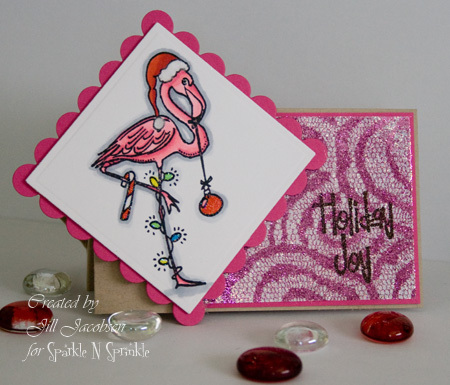 The flamingo is on the same stamp set as the snowman and colored with Copics. I added Sparkle Embossing Powder to the ornament and lights, then for the hat I added Snow White Flock with Brushable Glue. I have decided to do a class at Sparkle N Sprinkle with these 2 cards so if you are interested you can find the details here. I also had this image of Sue that I colored a while ago laying on my desk and decided to make a bookmark with it. I'd love to do a class!! :-( I love both of these. I thought the first one was cute - but this is even more awesome! Way to go Jill.